This accessible guide to the development of Japan’s indigenous religion from ancient times to the present day offers an illuminating introduction to the myths, sites and rituals of kami worship, and their role in Shinto’s enduring religious identity. John Breen is Reader in Japanese at SOAS (University of London) and Associate Professor at the International Research Centre for Japanese Studies in Kyoto, where he edits the journal Japan Review. His publications include Yasukuni, the War Dead and the Struggle for Japan’s Past (edited, 2008), Inoue Nobutaka, Shintō: A Short History (translated and adapted with Mark Teeuwen, 2002), Shintō in History: Ways of the Kami (edited with Mark Teeuwen, 2000), and Japan and Christianity: Impacts and Responses, (edited with Mark Williams, 1996). Mark Teeuwen is Professor of Japanese Studies at the University of Oslo. 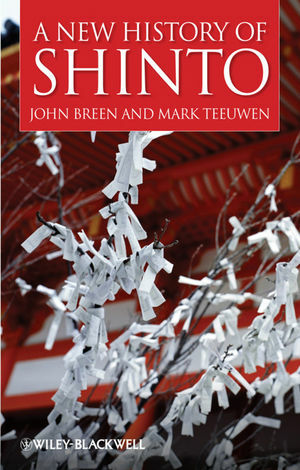 As well as the books authored and edited with John Breen, he is co-editor of Buddhas and Kami in Japan: Honji Suijaku as a Combinatory Paradigm (with Fabio Rambelli, 2003) and The Culture of Secrecy in Japanese Religion (with Bernhard Scheid, 2006). "Written by two scholars at the forefront of the study of Japanese religions, this book offers much more than a ‘brief history’. It is in fact a very bold and lucid attempt to redraw the parameters that govern our understanding of that elusive body of thought and practice we call Shinto … This book will surprise and on occasion shock; it will surely be required reading for all those interested in Japan and the Japanese."